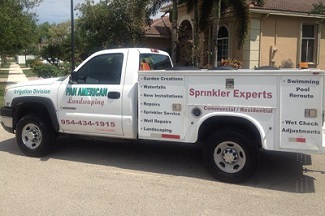 Pan American Landscaping, LLC is your ultimate source for lawn sprinkler and commercial irrigation system installation, located in Broward County with services in Dade and Palm Beach Counties. Pan American focuses on the application, conservation, drainage, and improvement of irrigation technology for residential and commercial clients. We are a fully insured company with over 20 years’ experience in the industry. The key to contracting a qualified Irrigation Contractor is licensing. Yes, anyone can dig a hole, lay pipe and connect it to a water source. However, it takes a licensed Irrigation contractor to ensure that everything that works well on day one will still be doing so six months or two years later. Service is also a big part of irrigation design and installation. Parts break down, that’s a fact. Our rates are competitive and we employ some of the top irrigators in the city of Davie. We focus on complete customer satisfaction and ensure our customers receive the finest irrigation service available. Our staff is knowledgeable, dependable, and here to meet all of your Lawn Sprinkler System needs in Broward, Dade and Palm Beach Counties. Pan American has the equipment to perform all sizes of jobs. We use quality materials produced among the world’s leading manufacturers of irrigation equipment for all turf and landscape needs. We use and we correct poor drainage problems by grading and/or the installation of drain fields.We offer a wide variety of services for new installation, existing systems, inspection, drainage, and all services such as repairs, swimming pool and patio re-routes. We provide a one year warranty on installations and as always estimates are free. 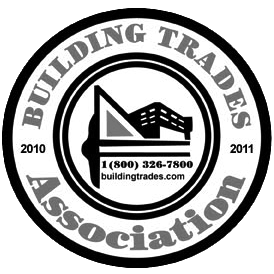 We are fully insured and can provide certificates of insurance and / or commercial job references if needed. We also offer free estimates. At Pan American we pride ourselves on designing, installing, and maintaining the optimal irrigation system to enhance your property at competitive rates. We are always at pace with the most modern products and technology. Our installations feature sprinklers that apply water effortlessly and efficiently at any location. Our systems include rain sensors and optional separate water meters depending upon location availability. We provide a one year warranty on new installations and will provide training of your system at any time at no charge. A top quality, professional installation is a must but our goal is to maintain long term customer satisfaction. We have a full service staff that can handle all service needs including service calls, repairs, winterizations, and spring start-ups. We can also perform backflow preventer testing and / or repair if needed. Even if we did not install your system we can service your existing system and all brands of irrigation products. We can also perform inspections of your property and evaluate your system to ensure it is functioning properly. Musty odors, soil erosion, lingering damp spots and damage to a home’s foundation could create a homeowner’s nightmare. However, costly repairs for patio, pool swimming pool. patio installation re-routes and home foundation damage caused by poor drainage can be prevented by surveying the area around a home and making simple, inexpensive changes. Identifying causes of poor drainage can be difficult. Surface runoff is the most common cause of drainage problems and includes runoff from rain, sprinklers, supersaturated soil, underground springs or a high water table. Pan American Landscaping, LLC has been providing drainage solutions for residential properties since 1994. From draining basement walls to ponding water, we continue to provide products to help eliminate water and keep key areas dry. With innovative drainage solutions, we can provide a drainage system to meet your needs! Residential & Commercial Irrigation and Sprinkler Systems services throughout Broward County including: Coral Springs, Dania, Davie, Fort Lauderdale, Hallandale, Hollywood, Lauderdale Lakes, Lauderhill, Miramar, Pembroke Pines, Southwest Ranches and Weston. Commercial accounts are professionally serviced in Miami-Dade, Broward and Palm Beach Counties.